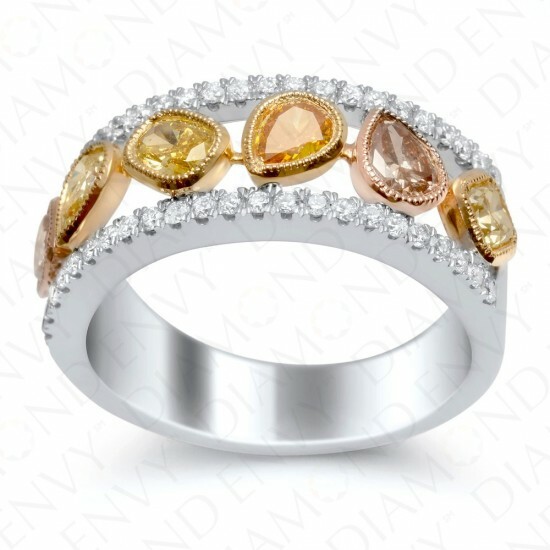 This eye-catching fancy colored diamond ring has six bezel set fancy colored diamonds including a Fancy Vivid Yellow diamond, Fancy Light Pink diamond, and a Fancy Deep Orange-Yellow diamond of different shapes totaling 0.99 carats. 46 white diamonds totaling 0.34 carat form a sparkling border around the multi-colored diamonds. Each fancy colored diamond is brilliant and the combined effect of the different colors makes the multi-colored diamond ring really pop. Gold weight: 7.02 grams. House graded.